FIGURE 3-9 Metabolism of thyrotropin-releasing hormone (TRH). 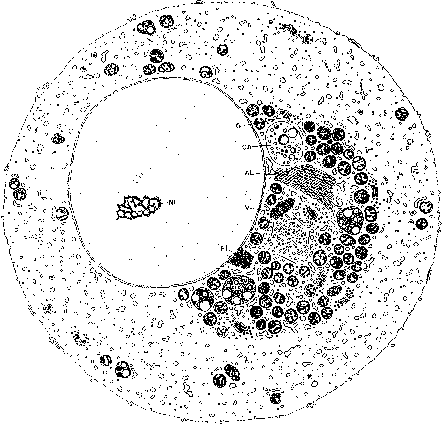 Reproduced from Fag-lia, G., and Persani, L. (1991). Thyrotropin-releasing hormone, basic and clinical aspects. In "Brain Endocrinology" (M. Motta, ed. ), 2nd ed., pp. 315-350. GRH has been localized to the arcuate nucleus of the hypothalamus. CRH also appears to be located elsewhere, in addition to the hypothalamic-hypophyseal axis. It has been found in the central nucleus of the amygdala (of the limbic system) and in polar neurons and dendrites in the cortex, as well as in some cells of the reticular formation. The dorsal motor nucleus has some fibers that may contain CRH. Some CRH-positive fibers terminate in the posterior pituitary and hypothalamic regions in addition to the median eminence. 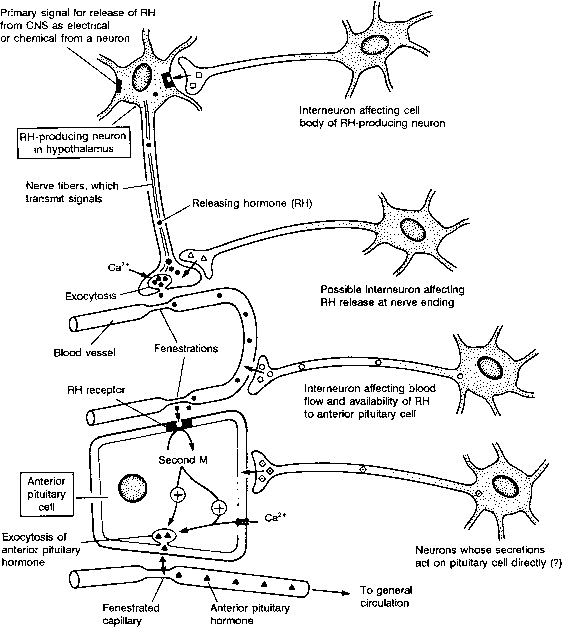 FIGURE 3-10 Neuronal controls of the secretion of releasing hormones. The pathway of synthesis and secretion of releasing hormone (RH) is shown in vertical array at the left. The peptidergic neuron synthesizes RH, which is released in response to electrical or chemical signals delivered by neurons, probably at the level of the cell body. RH is released by exocytosis from the nerve ending, where Ca2+ uptake plays a role in the process of exocytosis. RH, released from the nerve ending, enters the total hypothalamic-hypophyseal portal system by way of fenestrations in blood vessels (thin-walled capillaries). RH is transported to the anterior pituitary cell exiting the portal system through fenestrations. RH binds to specific anterior pituitary cell membrane receptor to produce a second messenger (second M), which enhances Ca2+ uptake and exocytosis of specific anterior pituitary hormone. Shown on the right are hypothetical interneurons than can act positively or negatively on RH release and transport at a variety of levels of the overall system. ventral portions. Angiotensin II is also located outside the hypothalamus in other brain areas. There appear to be many other active hormones as well, in addition to the releasing hormones. Neurons synthesize and package releasing hormone precursors in their cell bodies, and these products are transported down the length of their axons to the nerve terminals (nerve endings), where a signal is awaited for secretion. Since most of the cell bodies of these peptidergic neurons are located in various areas of the hypothalamus, signals for secretion come from higher levels, usually from aminergic or cholinergic neurons in various parts of the brain. The hippocampus (and amygdala) of the limbic system may signal releasing hormone-containing neurons by changes in firing rates of electric signals or by chemical interneuronal contacts (Figure 3-10). The specificity of the overall process is a function of the unique structure of the releasing hormone (Figure 3-8), which interacts with the specific receptor in the target cell membrane. For example, a hypophyseal cell (folliculotroph) producing FSH contains receptors for GnRH just as a cell producing LH (luteotroph) since both anterior pituitary hormones are released by the same releasing hormone, GnRH. In fact, one cell may produce both hormones. TRH interacts with receptors on membranes of the thyrotroph, producing TSH, and the lactotroph, producing PRL. Somatostatin has receptors on somatotrophic cell membranes that also contain GRH receptors since the control of GH secretion is under the influence of both releasing hormones. In addition, there are other regulators of anterior pituitary secretion, such as the aminergic hormones. A particular anterior pituitary cell membrane should contain all of the different receptors necessary for hormonal control. The aminergic neurons exert similar kinds of control at the level of hypothalamic neurons, which manufacture releasing hormones. Figure 3-10 shows possible mechanisms by which neurons synthesizing releasing hormones are regulated. The primary signal may be to the cell body of the neuron producing a particular releasing hormone. The signal is chemical (e.g., serotonin or other amine; in such cases, synthesis of the amine is likely to occur in the nerve ending rather than in the cell body) or electrical from an interneuron. The secreted releasing hormone passes through fenestrations (thin wall or openings) in the ends of the closed portal system connecting the median eminence with the anterior pituitary cells. Fenestrations overcome the blood-brain barrier, which otherwise might not allow polypeptides to be translocated. The releasing hormones enter the neighborhood of the anterior pituitary cells through fenestrations at the terminus of the portal system (secondary plexus) and then bind to specific plasma membrane receptors of target cells. This interaction produces a second messenger (second M), which directly or indirectly opens the calcium channel so that Ca2+ ions accumulate in the cytoplasm (Figure 3-10). The specific anterior pituitary hormone is secreted and enters the general circulation via fenestrations in local capillaries. These hormones then are transported to distant target cells that contain specific membrane receptors. Various interneurons regulate specific processes (Figure 3-10), such as events in the cell body of the releasing hormone-producing cell, secretion of releasing hormone, and blood flow in the closed portal system connecting the hypothalamus (median eminence) with the anterior pituitary. Regulators of releasing hormone release are shown in Table 3-2. Regulators including some of the releasing hormones for pituitary hormone release are listed in Table 3-3. It is obvious that control of secretion is complex. It is becoming more apparent that pituitary hormone release will have both positive and negative controls. In some cases, a regulator has one effect in vitro and an opposite effect in vivo. This table exemplifies the complexities of regulating the secretion of releasing hormones and anterior pituitary hormones (see Figure 3-10). TABLE 3-2 Various Agents Cause Release or Release Inhibition of Releasing Hormones"